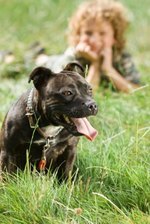 Because pit bulls are sometimes considered predisposed to aggressive and dangerous behavior, some laws across the country prohibit or place limitations on owning one. California has a state law against singling out the breed as vicious or dangerous to prevent ownership. However, the state allows individual municipalities to make rules about a pit bull's keeping and care. Fifteen of the 17 municipalities regulating the breed require that you sterilize your dog. It's possible to acquire a breeding permit, but only under certain circumstances. If your dog is a service or police dog, registered with the AKC or similar dog breed association or is a regularly performing show dog, your chances are more likely. Without a permit, you'll need to spay or neuter your dog in Riverside, San Bernardino and Sonoma counties as well as 13 cities, including San Francisco, Barstow and Santa Rosa. The City of Gonzales requires that you contain or control your pit bull at all times. To keep your pit bull within the law, you must keep him either indoors or in a kennel. When you take your dog out in public, you must keep him on a leash and muzzled the entire time he's not contained. The city requires you to hold your dog's leash the entire time you are away from your home and don't tie your dog up. Other cities such as LaVerne have similar laws for vicious or dangerous dogs, but don't single out pit bulls as a breed. Laws vary from city to city, so check local regulations before buying or traveling with a pit bull.